In light blue with black leather interior. This very pretty Mk1 Roadster has just arrived at Pye Corner and we are currently preparing it for sale. It came in to the UK in 1997 and we believe that it was restored and sold on. It had three owners until we sold it to a friend some years ago for his small collection of about ten cars. 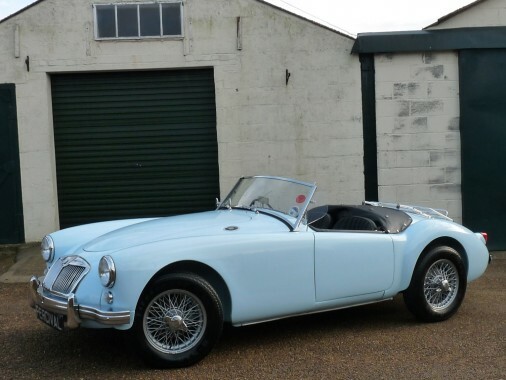 He hasn't used the MG much but decided to refresh it a couple of years ago which include a bare metal repaint in Honolulu blue, new wire wheels and tyres and a conversion to front disc brakes. The bodywork is immaculate and blemish free. The black leather seats remain in superb condition as do the carpets. The hood and frame are clean and unworn.